This is a short tutorial on how to use the search feature in the portal. First sign into your portal (if you need help call). 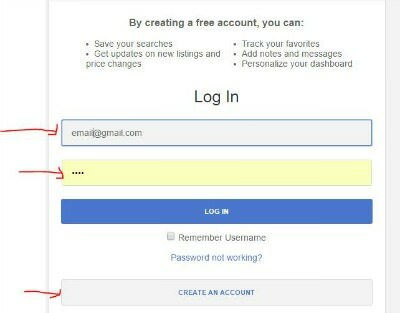 The sign-in is necessary so there is somewhere to save your searches. Use your email address and password… I like 1234. This is on the home page. Now you are in your portal. Select a basic search you will edit. You can pick a basic 55+ search if you want a 55+ community. Or a basic single family search for a stand alone single family houses. Or a Condo search if you want a patio home, townhome, apartment like flat…some kind of attached home. Or a basic Mobile home search. Now lets edit it. In this example I will edit a basic single family search. Now first pick where you want to search….this is set up with Mesa, Gilbert, Chandler, Queen Creek and Apache Junction….if you don’t want one click on the ‘X’…want another city start writing it in a drop down will come up with towns to choose from. Next set a maximum price. Next — what is the minimum number of bedrooms you want. Next–Minimum number of baths. 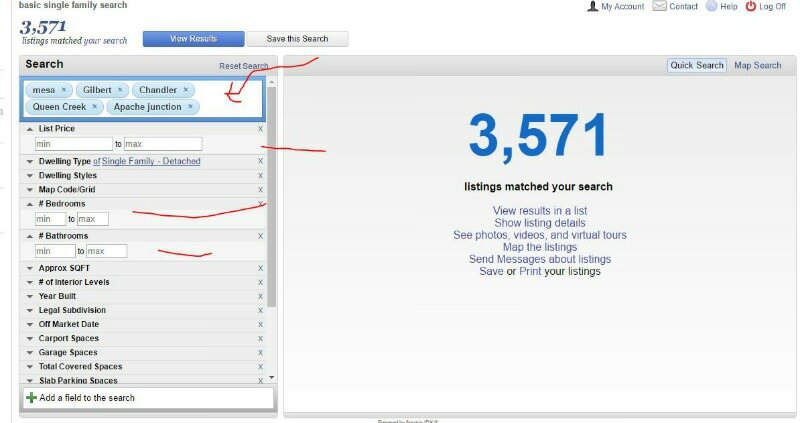 There are 3,571 homes in the basic search. This is the FULL MLS for these towns and single family and available to buy. 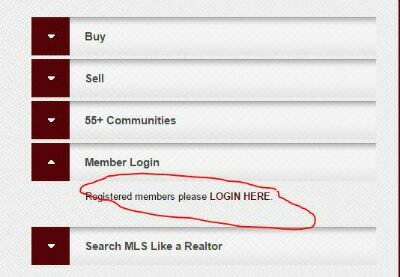 If it is listed on the MLS it is here. Picking the # of bedrooms will cut down the number of homes shown. Now you can set a house size if you want. If you want a 1 story set maximum # of interior levels as 1. Do you need a 2 car or 3 car garage? Set that here. If you want a pool click on the word before ‘no pool’ till ‘not’ comes up….so you want ‘not no pool’….crazy right.. so any kind of pool will show up….lap pool, play pool, heated pool. Be careful about setting to many requirements or you may get zero results. If you don’t get enough results try to adjust the parameters. You need to be flexible. Now click ‘save this search’ at the top. Name the search. Now view the search–click ‘view results’. 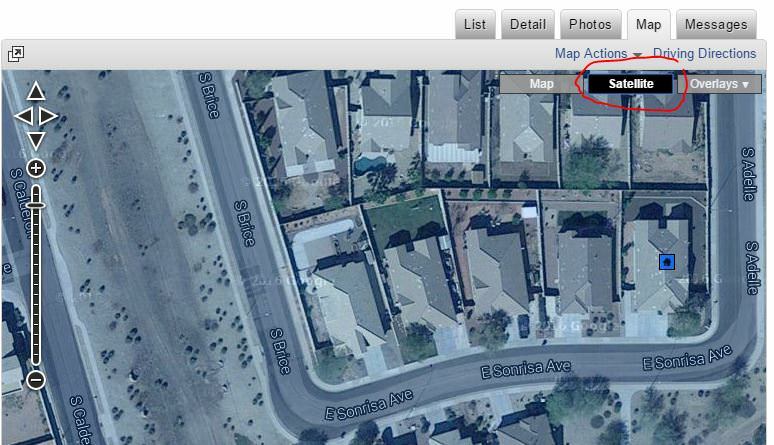 You can view a list of the homes, a detail of one home, photos of one home, or a map of where the homes are. You can save homes you like. Click on the star next to the homes you like. These homes are saved in the left column by the star…the number of save homes is shown here…3 in this example. If you click on the ‘saved’ in the left column it will show you just the save homes. 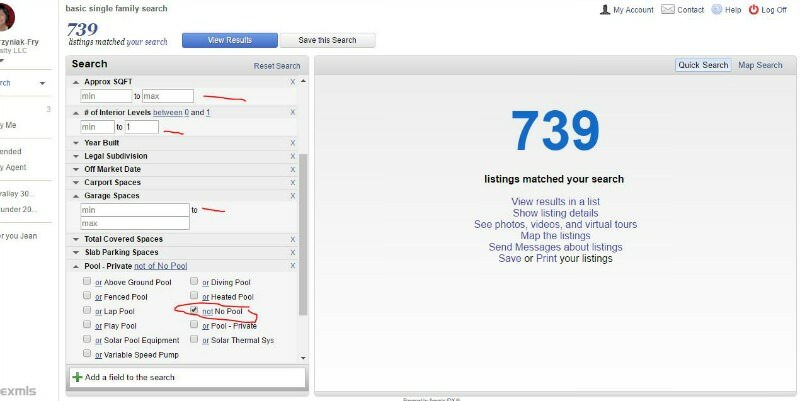 The left column also lists the saved searches you have made and those the realtor (me) attached to your account. Realtor assigned– in this case 1 desert valley 30 day. Your saved searches–in this case chandler under 200,000. You also have all the email updates your realtor sent you. One more fun thing, in map rest to satellite. Get a cool view of the area. If this is overwhelming… email or call me. I will set you up.